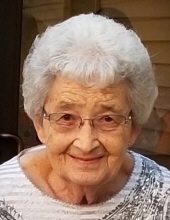 Geneva J. Foraker, age 87, of Caldwell, died Sunday, January 20, 2019 at Summit Acres Nursing Home in Caldwell. She was born June 1, 1931, in Zanesville, daughter of the late M. Calvin and M. Clarice Danford Mendenhall. She was a 1949 graduate of Forest Grove High School. Geneva worked for several years at the Western Auto Store in Caldwell, which was owned by her parents, continuing there when Gene and Cricket Matthews took ownership, and served as a poll worker for the Noble County Board of Elections. She was a homemaker, a member of the Caldwell Church of Christ, the Good Neighbors Quilting Club, and was a member of the Kay Bowling Housewives League at King Pin Lanes in Cambridge. She loved to quilt, knit, and crochet. Geneva had worked in ceramics, enjoyed gardening and canning. She will be remembered as a devoted Christian, a loving wife, mother, grandmother and great-grandmother. In addition to her parents, she is preceded in death by one sister, Janet Bertram and one brother, Merritt Mendenhall. Surviving are her husband Dana B. Foraker, whom she married July 10, 1949; her children, Patricia A. “Patty” (Robert D.) McElfresh of Caldwell, Ronnie G. (Denice D.) Foraker of Belpre and Donald R. “Beanie” (Stacy M.) Foraker of Cambridge; her sister, V. Jean Ramsey of Caldwell; 12 grandchildren; 15 great-grandchildren; several nieces, nephews, cousins and friends. Friends may call Thursday, January 24, 2019, from 4 to 8 PM at McVay-Perkins Funeral Home, 416 East Street, Caldwell, where the funeral service will be observed Friday, January 25, 2019 at 11 AM with Pastor Jim Garrett and Pastor Mark Frenier officiating. Burial will follow at Sharon Cemetery. Memorial contributions may be made to the Caldwell Church of Christ, 104 Cumberland Street, Caldwell, Ohio 43724. To plant a tree in memory of Geneva J. Foraker, please visit our Tribute Store. "Email Address" would like to share the life celebration of Geneva J. Foraker. Click on the "link" to go to share a favorite memory or leave a condolence message for the family.